Croft saw the first snow of the year with George resuming his battle in the BMW MINIs final race of the season .The car fitted with the new side skirt protection preformed faultlessly through the day securing a second row in the final race . Kiefer secured the final win with George in second . Sunday saw a rise in temperature bringing the rain to Croft for the Grand Prix .The day started with a major high speed crash between George & Fons leaving Fons car severely damaged & George’s missing a front end .The team sprung into action and rebuilt the front of the BMW getting it out for the next heat securing a 2nd in the final . Many thank’s to all the team for all their effort over the weekend, roll on the 24th. GET BETTER SOON TERRY WE MISSED YOU . The weather held for a fine day in sunny Wales with no rain . Tom held it together all day on the last meet for classic mini’s in rallycross by finishing with a 1st in the final to end the 2012 series. Mark had a hard day after breaking a throttle cable in heat one & after dropping a valve in heat two.He then had to change the engine head making it out for the final finishing 5th but getting a 1st for determination from the team. George finished 4th in the BMW Mini, with a day dogged with car damage. The new engine proved to be working well since the change but this was marred by the driving standards of other drivers, similar to that of banger racing hopefully not to be repeated . 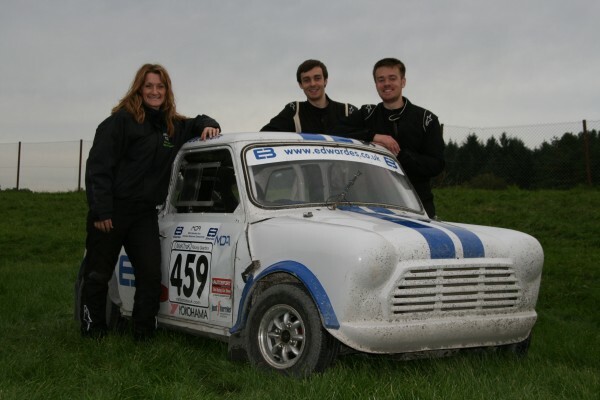 Due to the end of Classic mini’s in rallycross 459 will now be retiring . The car built by Revival’s Motorsport took Shelley Wakeling to championship wins in 2007 /2008. Two years later George Edwardes won the 2010 championship with Tom Edwardes his older brother winning the 2011 championship. A fitting end in the history of 459 a legend and a credit to its engineer Richard Wakeling & all his team at Revivals Motorsport, Terry,Wayne & Mark. 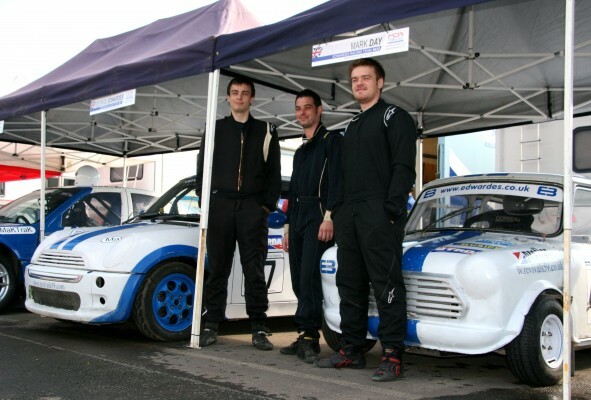 Tom & George head south to Wales for round 5 of the British & Clubman Rallycross Championship. The two brother’s will be joined by Mark Day in his second race with the team. Revivals motorsport will be out in full force. Paul,Richard & Shelley with the debut of the new Honda after her roll at Lydden hill . Round 4 of the MSA Monster Energy British Rallycross Championship heads to the teams home track of Lydden Hill circuit in Kent per the weekend of the 26th/27th of August. 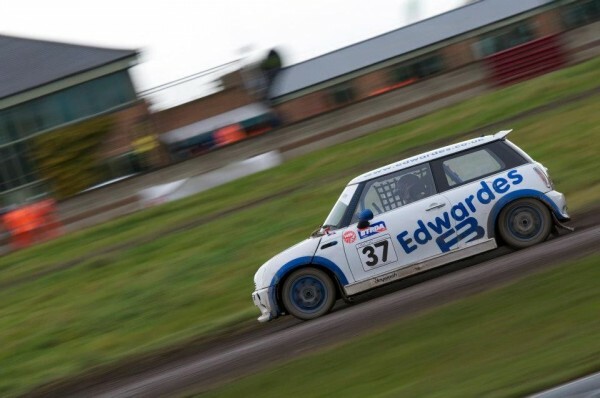 Edwardes Racing Team will be fielding just George’s BMW Mini at the event (not being part of Thomas’ clubmans Mini-Cross championship), which will also be running under the name of the ‘Mayhem – Action Sports Event’. The August Bank-Holiday classic will not only be featuring Rnd 4 of the British Rallycross championship but also showcase other ‘Extreme Action Sports’. These including on track demonstrations by international Drift stars, FMX and BMX riders, attracting some of the top names from their respective disciplines, in what will be a great weekends family entertainment. George will once again be racing in the British Rallycross BMW Mini class, with the aim of consolidating his 2nd place in the championship and closing in on title rival Kris Hudson. The Kent track is one of George’s favourites, having secured 2 overall victories and many podium finishes. Continuing on from George’s strong showing at Rnd 3 of the Championship at Mallory Park, a overall event win is certainly a possiblity and the teams main aim for the weekend. On track action is split over the two days with racing set to commence on Sunday afternoon, with the finals to be held on Monday. For more information and directions head to http://www.lyddenhill.co.uk/. Strong result for the team in Rnd 3 at Mallory Park! July 27, 2012 Racing Comments Off on Strong result for the team in Rnd 3 at Mallory Park! Edwardes Racing Team scored another strong result in Round 3 of the British Rallycross Championship held at the Mallory Park circuit in Leicestershire. Both Tom and George finished 2nd in their respective classes after a fast and exciting days racing. The British summer finally made a presence with the team enjoying a very hot days racing with both drivers completing the day without any issues. After a difficult start in the first heat, George would finish his race in 4th behind a strong field of competitors on the rough Mallory track. However, George showed his potential speed positing the fastest lap time of 58.599, 0.200 faster than anyone else. Heat 2 saw George finish in 3rd position with once again a strong performance. Although only finishing in 2nd position, Heat 3 saw George’s true speed come to fruition as he chased down leader Kris Hudson after a first corner squeeze that saw the Edwardes Racing driver drop to fifth. Passing three cars on the second lap, George would go onto close on the leader with once again positing a lap time a second faster than anyone else. George started the A final on the outside of the front row and after a strong race where he once again chased the leader Kris Hudson down to the final lap, finishing 0.300 behind after a chaotic race. George would end the day with a solid 2nd position with his strongest performance yet in the BMW Mini class. This result moved George up to 2nd in the British BMW Mini championship standings. Tom had an equally strong day with two heat wins in the 2nd and 3rd heats allowing him to take up the pole position slot in the A Final, alongside his great rival and team engineer Richard Wakeling. After a great start, the two top drivers ran side-by-side through the long first corner. It was however Wakeling who managed to squeeze his Classic Mini down the inside of Tom through the tight and twisty first sector leading onto the back loose.From then onwards it was down to Edwardes to chase down the leader whilst defending from a resurgent Mark Griffin. Tom would end up finishing 2nd to Richard, 0.300 of a second behind the winner, a feat more impressive considering that Tom drove the last 3 laps in fourth gear after a clutch failure which in most circumstances would have caused the cars retirement. Tom still retains 2nd position in the Mini-Cross championship as they head into the final few rounds. Mark Day, Edwardes Racing’s 3rd driver for the weekend finished his first Rallycross event with a strong 4th position in the Mini-Cross class, quickly getting to grips with the unique characteristics of classic Mini. It is yet to be confirmed whether Mark will drive the car in the remainder of the 2012 championship. The team now has a short break before heading out to the August Bank Holiday classic for Rnd 4 of the British Championship at Lydden Hill in Kent on the 26th/27th of August. Although being the teams home event, only George will be racing at this event in his BMW Mini as the event is not part of the Mini-Cross championship. Make sure to regularly check the teams website, Facebook and twitter to find all the latest news and information on the teams activities throughout the year! Check out our latest video that we’ve just uploaded showing all of the action from the race in Holland captured on George’s GoPro helmet camera. George would end up finishing 3rd overall after leading most of the A-Final, only dropping down the order after taking his joker lap. After two successful race weekends out in Europe, George will be returning to the teams BMW Mini in Rd 3 of British Rallycross Championship at the Mallory Park race circuit in Leicestershire. Thomas will be once again out in the Mini-Cross class, driving the championship winning No.459 classic Mini, hoping once again to take the top spot in the class and more valuable championship points. As mentioned previously, Mark Day (Revivals and Edwardes Racing mechanic) will be making his Rallycross debut for the team at the leicestershire track. 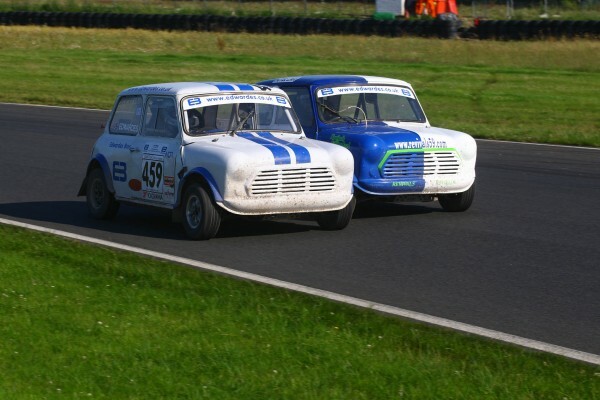 Mark will be racing the teams second classic mini-cross car, No.432 in the Mini-cross class. 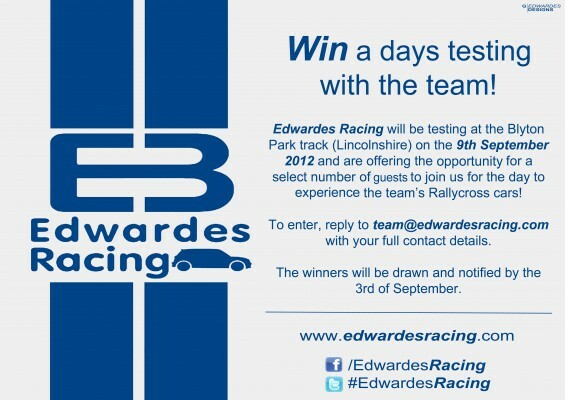 This will be the first event of the 2012 session where the Edwardes Racing Team will run a 3 car team in the British Rallycross Championship. Make sure to keep checking the website, Facebook and Twitter over the weekend for the latest updates on how the three drivers are getting on with more videos and photos to be uploaded from all the events very soon! Reports from Belgium on the first race at Maasmechelen on Sunday are that George set the fastest race time of the day & winning the third heat of the day but his luck ran out when in the final race he was involved in a collision with another car forcing him car into the barrier and out of the final . On Moving to Holland the car was rebuilt ( thanks Richard ) and made ready for the race on Sunday 15th in Valkenswaard. We are please to announce a new member to the team . 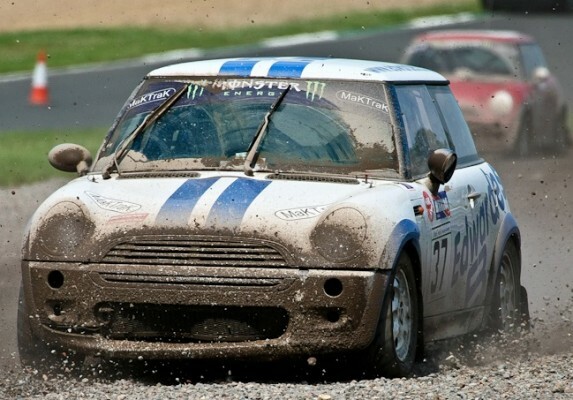 Mark Day will be racing 432 in his inaugural rallycross race at Mallory Park on the 22nd July 2012. We will be entering two classic in the MDA/BTRDA Clubman’s Championship, 459 Tom & 432 Mark. 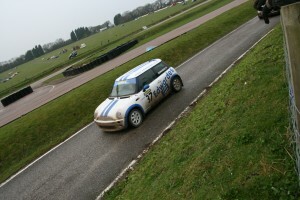 George will be competing in car 37 the BMW Mini in the British Championship. 432 has been fired up and rolling road tested at Revivals this weekend after a total rebuild as a part of the special British week in Europe . Thanks to all Revivals Motorsport.